Three free games with my new graphics card? Thank you very much NVIDIA! What a pleasant and unexpected surprise. Setting an alarm in Android 4.4 (KitKat) is just as annoying now, I miss being able to tap in the time instead of moving virtual hands. Why can't I type in numbers for the mobile data limit on my phone? I have to drag a fiddly bar up and down. Felt mean for not tipping the guy, but my order was shockingly late. It shouldn't take *that* long for beans and cheese on toast. I've recently signed up to a new mobile contract with Three because they offer unlimited data (with tethering allowed) for just £15 per month. Sure, the customer service may not be as good as the fantastic service I've had from Vodafone over the years, but it is less than half the price. I signed up for a My3 account last night. 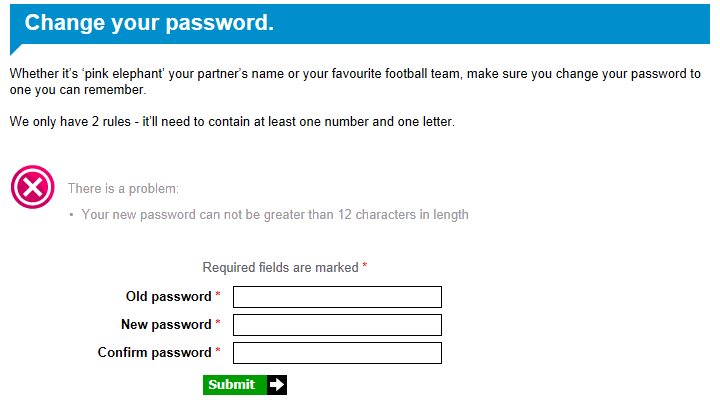 Apparently they only have two rules for your password. Except I found the secret third rule: password length. Yes, that's right, they have a maximum length of only 12 characters. I could understand a secret rule for a minimum length (because some people are probably stupid enough to enter 1D, for example). But why have such a low maximum length? I can only think of a handful of reasons why. Hopefully it's not for one of the more scary reasons. Do I root my Nexus 5 for the sake of it? Started playing around with Windows Azure today, I now have a Windows Server 2012 R2 VM up and running for free!